Visit rosieMADE.com to support women-friendly businesses, US-made products. Enter NOW to win FREE giveaways. 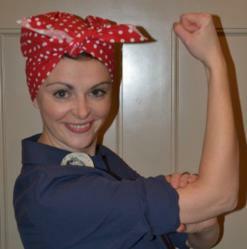 rosieMADE founder Alicia Vanderschuere wants all women to be as strong as "Rosie the Riveter"
I can’t change the way American corporations work. But I can give new opportunities to women who work hard but don’t get the same rewards as men. If you drink coffee, odds are you know about “Fair Trade.” But what about fair trade for women in America? The Fair Trade sticker on a bag of coffee means workers in Ethiopia, Guatemala and other countries are getting fairly compensated for their labor. Now, if only there was a program like that in the U.S. Enter rosieMADE.com, the brainchild of Idaho resident, corporate survivor, and women entrepreneur Alicia Vanderschuere. rosieMADE (http://rosieMADE.com) lets consumers “vote with their dollars” by purchasing gifts made in the U.S. by “women-friendly” businesses. To qualify, businesses must be owned or co-owned by a woman, have a female president or CEO, or have at least 50 percent of top managers who are women. Visit the rosieMADE blog (http://rosiemade.com/blog) NOW and enter to win hundreds of dollars in free giveaways—just in time for the holiday season. Increase jobs and wages for American women. Increase revenues for women-friendly businesses. Support women’s continued fight for equal wages and opportunity. In addition to promoting products, rosieMADE will also serve a resource, offering women entrepreneurs information and links on business, work/life balance, and leadership. And it will provide inspiration in the form of “Real Life Rosie” stories about successful women entrepreneurs. Vanderschuere will also set aside a portion of profits to endow her rosieMADE Foundation, which will provide start-up grants to women entrepreneurs. About rosieMADE.com: Founded in 2012 in Boise, Idaho, rosieMADE.com serves women entrepreneurs in the U.S. by selling gift products created by women-friendly businesses and by providing useful information on starting and running a business.